Rightly Dividing the Word Saved! 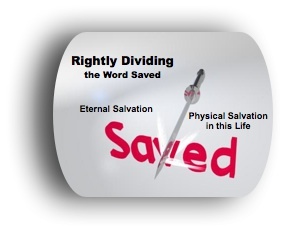 Rightly Dividing the Word "Saved"
Rightly Dividing The Word “Saved”! Years ago the Lord was teaching me about the mechanics of salvation unto eternal life. He showed me that the Bible, as we have it now, does not differentiate between the word “saved” when it is referring to salvation unto eternal life and the word “saved” when it is referring to salvation in the physical, salvation in this life. Both were translated “saved” in English. When the Lord showed me this I understood it, but I had no idea how far reaching this problem goes into the false doctrines of men concerning salvation unto eternal life and even causing the condemnation of people at times when there should be none. The results of this mistranslation, this lack of understanding, bleeds out into any number of subjects such as the Kingdom of God, cast into outer darkness, scriptures and more. It is like an oozing poison attacking people, the truth, and the purposes of God. The enemy of mankind loves it. I was given this particular knowledge about the word “saved” years before the Lord told me, “No man can translate without getting his doctrines in it.” Whether this happened because of man’s doctrines or just a simple mistranslation is really irrelevant. God reveals we are to rightly divide His Word and this mistranslation, or lack of translation, causes a great misunderstanding when it comes to the big picture concerning salvation. I will share what happened and then we will look into some of the effects of not totally understanding where our eternal salvation is seated permanently. I will also share examples of “Salvation in the Physical,” the Mechanics of, or the pattern necessary for us to obtain “salvation in the physical” in this day as the Lord’s Bride! One day while God was teaching me about the “mechanics of eternal salvation,” I was reading my Bible to have some words lift up off the page about a half inch. The Lord brought my attention to the word “saved” in the following scripture. Which sometime were disobedient, when once the long-suffering of God waited in the days of Noah, while the ark was a preparing, wherein few, that is, eight souls were saved by water. The Lord began dealing with me about the word “saved” here being different than the word “saved” in what Paul taught concerning salvation unto eternal life. I don’t know if I was engulfed in the vision or what but somehow I saw the spelling of the words, I think in Hebrew, and they were different. The Lord took me to the following scripture to further confirm the separation of “salvation unto eternal life” from the “salvation in the physical” in this life that we work out by obeying Him and not breaking God’s laws. Whoever therefore shall break one of these least commandments (law), and shall teach men so, he shall be called the least in the kingdom of heaven: but whoever shall do and teach them, the same shall be called great in the kingdom of heaven. At that point I realized that there were people in heaven right then who had declared their belief in Jesus to another person on this earth, obtaining eternal salvation, even though they taught God’s word incorrectly. Some had even taught that baptism in water saves you or that you gain eternal salvation by praying a prayer of salvation. These people who taught God’s word incorrectly are called the least in the Kingdom of Heaven, but are still in Heaven! Saved! Why? Because they had accidentally worked a single covenant promise correctly even though they didn’t understand it! Wow, what a learning experience! It was soon after that that I was given the understanding of “why” Paul the apostle had turned a person loose for the destruction of their flesh so that their spirit might be saved. To deliver such an one to Satan for the destruction of the flesh, that the spirit may be saved in the day of the Lord Jesus. Paul did not want this person to lose their salvation unto eternal life, He knew they were headed down a path towards the possibility of denying Christ. The Bible is clear that a person can lose their salvation unto eternal life, but It is not like a lot of people think. You do not lose your salvation unto eternal life because you sinned after your spirit was born again. (We are all sinners and fall short as the Bible says.) People ask me how we lose our salvation unto eternal life and I have told them that a person does the reverse of how they obtained eternal life. Here is an example of denying Jesus: If you were brought before a firing squad and told to denounce Jesus, or your belief in Jesus, or be shot, you better not do it. You will lose your eternal salvation and have your name struck from the Lamb’s Book of Life. This is an example of “the picture” we need to understand of how a person loses their eternal salvation. So always hold on to your confession or declaration of belief in who Jesus is. To sin is to break God’s Law and to break the Laws of God is to sin. The Bible is clear that Jesus did what the law could not do. So we see that if the Law could not give us eternal life (it is a gift, not earned), we should also see that the Law, or sin, cannot take away eternal life. The breaking of the law (sin) cannot, of itself, take away our eternal salvation because our eternal salvation (the gift) is in Jesus, not in the Law. God spoke back to me out of the vision, "It is pride for them to think they could know anything, not getting it from Me!" I have been told that I know how the Marriage Ceremony of the Lamb takes place and that I understand the Mechanics of Eternal Salvation. Everything else is, “I only know in part!” It is dangerous to think we know something without the Lord revealing that we know it, yet there are numerous people who think they know a lot of things concerning a lot of subjects. Most don’t realize they are just walking in the patterns they grew up in. We must talk about these wrong patterns as well as the right patterns or we won’t have the total picture. It’s kind of like when the Lord told me, “You have to know what a scripture doesn’t say to know what it does say.” So if we don’t know the wrong patterns, we will not really see the full picture of the right patterns. The Lord has revealed how serious it is. After I started writing this article, in a ministry meeting on 12-20-2009, we were given the word “charlatan” with some instruction. God is not being critical here but just revealing truth. That truth can set us free if we let it. In general, charlatans are people falsely claiming to have a special knowledge or skill. Going back into the origin of the word, it denotes an itinerant seller of supposed remedies. I was then given a dream on 12-24-2009 and suddenly realized the Lord had given it to use in this article because I was looking at charlatans. God says, “Let us reason together!” This certainly indicates we need to use our minds. I have said many times that if Christians would use their minds more instead of just assuming things, they would realize they have a false idea or a false doctrine in their life. I have chosen to call this section Plain Talk because, at the direction of the Lord, my intent is to expose a few of these unreasonable ideas and unreasonable things people say. Concerning the Holy Spirit’s teaching ability, the Lord said, “If something suddenly strikes you as being simple and it makes sense, it’s true.” “Making sense” has to do with using our minds and putting things together. Christians are in a serious business and there is no room for error. I was saved not because the pastor actually knew and understood how salvation unto eternal life works but because of the leading of the Holy Spirit. What if this man had not obeyed God’s leading? God wants this problem corrected. I had the Lord tell me years and years after He taught me the Mechanics of Salvation unto eternal life that my daughters would still not be saved had He not entered my life. It is highly probable that even to this day they would still not be saved. I owe the Lord! Let me start with one scenario that is fairly common. There are many Christians who believe in deathbed confessions. Yet some of these same people in a non-deathbed confession situation will say that someone was not really saved (unto eternal life) because there had been no change in their life; they didn’t get rid of some sort of sin in their life. These two ideas are not consistent with each other. If we are going to believe both ideas are true then we should kill any person who has made a confession immediately before they have a chance to sin. Think about it! Getting rid of sin (after your declaration of who Jesus is to another person) does bring a salvation in the physical. It shuts doors to the enemy of mankind. God wants everyone to do this! But for people to say you must get rid of sin (after your declaration of who Jesus is to another person) or you’re not saved unto eternal life is salvation by works theology. Paul was clear: salvation unto eternal life is not by or through our works but through Jesus Christ. Knowing that a man is not justified by the works of the law (sinlessness), but by the faith of Jesus Christ, even we have believed in Jesus Christ, that we might be justified by the faith of Christ, and not by the works of the law: for by the works of the law shall no flesh be justified. Paul spoke against the idea of the Law, or the absence of sin, saving you. Christ is become of no effect to you, whoever of you are justified by the law (not sinning); you are fallen from grace. The error of not understanding where salvation unto eternal life is seated allows for wrong ideas to seep into our thinking. I’ve heard pastors say people are going to hell if they don’t get sin out of their lives, which is salvation unto eternal life by works. The Bible says all have sinned and fallen short, so we see these very pastors have sin in their lives and according to their own doctrine they won’t make it. There is another type of justification (salvation) that comes through works, through obeying God! Rahab (and her house) received a physical salvation as a reward. Noah received a physical salvation (and all who were in his house) through his faith in God and through his own works, his obedience. It all works together. So we see there is a justification, a type of physical salvation, through obeying God. I have shared two justifications or salvations revealed in scripture, but what about this type of physical salvation in our day? How would you like to have the Lord say this to you? MY presence is as a sweet aroma, delighting you because you are MINE. Living in MY presence brings blessings unfamiliar to the world. This is because I hold you in MY hands and keep you. I have given you a heart to be separate from the world. The world's offers don't last. True beauty is made by ME. It is nothing created by man. Satan tries to distract you with polish but it is not working on you all. The world is tilted out of whack, out of alignment. Stay away from distractions. Focus. Keep your focus on ME. I know the couple who received this in their Golden Meeting. These are the same people whom the Lord delivered from the hurricane that hit Houston 9/13/08. Living just a football field length from the gulf they had been told to move to a particular town. The Lord even told them what size the hurricane would be and that they were not to tell people; that He would reveal to whom He would reveal. It is obvious to me that the Lord wanted to present a picture of Him being able to protect His Bride through her obedience. The man said they would have lost their business had they not obeyed. The Lord gave no choice as to where they were to move. They were saved from a lot of anguish in this life. They were justified, saved in the physical, just like some people in the Bible were saved by their works, their obedience, and it happened in this day. This was not “saved unto eternal life” but “saved in the physical,” justified through their faith and their previous obedience! What had they done? They started to walk in the “Mechanics of how to walk as the Lord’s Bride.” They had rid themselves of the three spots link, come out of the church link, and most importantly started to follow after the “things of the Spirit!” link They were having Golden Meetings link and as you can see from reading the word to them, the Lord is well pleased with them. They had allowed the Lord to build a relationship with them that comes no other way. This is because it is the Lord’s design! I have told this story because Christians need to see that there is a justification, a salvation that can come in the physical by obeying the voice of the Lord in this day. It is important to learn the Mechanics of “Physical Salvation” as well as the “Mechanics of Eternal Salvation.” Both need to be walked in during these Last Days. It is important for Christians to realize the Lord is bringing forth His Bride and they need to get into what He is doing now, in this day. When God delivered Israel from Egypt, the people had to get into the flow of what God was doing. When they got out of the flow, things went awry. It’s the same now. He is manifesting His Spotless Bride; Christians need to get in His flow. Yet the Lord has revealed that few know it! We as Christians must learn to keep the two different justifications, the two different salvations, separate. Number one being the eternal justification (eternal salvation) through Jesus Christ; number two being our physical justification unto salvation in the physical on this earth. Is this couple I have shared about sinless? No more than you or I are sinless! As the Lord has said, we as Christians need to focus on Brideship (not sin)! If the enemy can keep our eyes focused on sin, then we will never focus on Brideship; it’s not possible to focus on both at the same time! The main focus is to be on Brideship and focus on sin must take a second seat. The Lord wants the condemnations to stop. I have had people tell me they gave up because they fell back into sin after turning from it. Some even think they are going to hell because it has been preached to them that way. It is sad because they do hold the key in their heart that Jesus is the true Son of God and that He died for them. Where did this false concept of eternal salvation through our works come from? Was it inspired by the church, or the devil himself? The Python spirit has had a heyday with “salvation unto eternal life” through works. I remember years ago when the Lord dealt with me about a vision given on a tape and shared in some of the churches where a person was taken to hell. In hell there were special types of tortures for those who did not begin or finish their God-given ministries. A man who was attending our meetings wanted to play the tape but the Lord stopped me from letting it happen by revealing it was a python experience this person had. The Lord dealt with me revealing the subconscious picture given in the pythonic scene was that a person was going to go to hell if they didn’t finish their God given call. My eyes were suddenly opened to all the condemnation of believers in the person’s experience! This was salvation by works and it was being introduced into the church through a Python experience. The church is generally ignorant of the Python spirit. Not knowing where salvation unto eternal life is seated is part of what allows the Python to operate unknowingly. We must understand that there is no condemnation in Christ Jesus and to walk with Him as His Bride, His liaison, we should not have condemnation in us either. There are ways to speak and do things correctly without condemnation on our part. He told me that he could not go to his pastor or they would throw him out of his church. See the condemnation the Lord is talking about! Anyway, he confessed his sin to me and I told him the Lord would deliver him. I’m not sure how long, but I think it was four or five months later we crossed paths again and the young man told me he had had no problem with the sin since the phone call. The Lord had delivered him! The covenant promise that has to do with “salvation in the physical” worked. We as Christians need to understand the concept of covenant promises working independently and not assume something because one of them worked in our lives. Here is a scripture some pastors use to suggest that if you have done this you will obtain eternal life. With that I headed back to the house, wondering! I didn’t know it was the Lord at the time. I started to realize that some of the people I knew who seemed to have an ax to grind, so to speak, had had something happen in their life to cause them to act the way they were acting. I saw this when I was on the school board and all through my life. Knowing this has helped me be more forgiving towards certain people by knowing there is a reason they think this way or act a certain way. The reason I have brought up this experience is because I know it had to do with seeking the Lord with all my heart and He answered me, yet I was not saved, my spirit was not born again until I was in high school. Here is another false doctrine that I want to use to lead into an important point. I had a friend contact me through e-mail and phone. In the conversation it was revealed that he was having to stand against a few people he knows, some well-known men, who were falling into various variations of: everyone is going to become saved before it’s all over because there is no eternal hell. Later in our e-mail conversation he told me that he was being called a lot of things and that one had even told him he was going to hell! Oops! 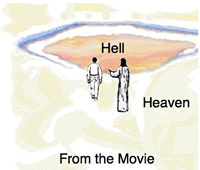 Here is one of these people saying there is no hell, but telling someone they are going to go there. I guess we could call that a no brainer, literally. Speaking without thinking is bad but teaching without thinking is worse. This is a bigger obstacle than it appears to be. It must be important to realize or God would not have told us. These believers who come up with there is no hell, there is no devil, and the like are certainly candidates for the possibility of their spirits not having been born again. God knows, we don’t, but we should recognize all the possibilities and act accordingly. While writing this article the Lord gave me a scene on 1-1-2010, in which people had to eat some very hard candy. It was so hard that they had to use their back teeth to crack it, and I wondered if they could. It was like a rock! It was gold in color and sweet (at least on the outside). In the scene it was also revealed that these same people had to kill their pets. The pets were blondish (dingaling thinking) with a little gold mixed into their hair. I realized the scene had to do with this article and in fact was given for it. God was simply revealing symbolically what Christians have to do! The list can go on and on. These people have gotten away from what Jesus accomplished at the cross and the fact that eternal salvation is all in Him! “The first time the Lord showed me a person's doctrinal pet He revealed that it was a doctrine (belief) the person (owner or holder) didn't want to give up. Here I must emphasize that the word "doctrine" could be translated "teaching," but in this case the doctrine (set of thoughts on a certain subject) had never been taught to this person. It was something this Christian had grown up with or grown into because it was happening, being practiced, as "the way you do it" for years. It was something they wanted to believe, something they wanted to hang onto. Thus we see a correlation between wanting to keep something that is not true, and wanting to keep a pet.” Read the whole article. In the scene it was revealed that those who ate the candy had to also kill their pets. It is a complete package. You can’t do one without doing the other and have God’s desired results! Seeing this, the situations I had written about in this article started racing through my mind. It suddenly hit me that the charlatans the Lord has built a picture of in this article are certainly unknowingly on the wrong side of Mercy. Especially those who tell people they are going to hell because of sin. The Lord gave me another scene on 1-2-2010, to place in this article. I had thought I was done. In the scene I saw the scene of the Golden Floor given to us years ago, on which Christians are to walk. It’s the floor that reveals we must pay attention to the three main spots all the time, or we might stumble in our walk with the Lord. The Golden Floor was superimposed through a man in his feet and in his heart area. I knew the Lord was revealing how important Rightly Dividing the Word “Saved” is to Him and to us. The Lord wants us to understand the difference between eternal salvation, physical salvation, and how to walk in both, keeping them in our hearts because it is most precious in His own Heart.